Millennials are delaying home ownership. The result is an extended rental trend among 25- to 34-year-olds that is fueling real estate opportunities of its own. The group, which is the nation’s second largest generation, is starting to form new households, but unlike past generations, that doesn't mean buying a starter home. Weak job growth and wage gains among millennials don’t have the group looking to buy anytime soon. Home ownership among those 35 and younger has fallen from 43.6% to 35.9% during the last 10 years. In February, housing starts fell 17% nationally, due mostly to the lack of young buyers, according to The Wall Street Journal. The young generation wants flexibility in their future and has concerns about their credit rating, lack of savings for a down payment and whether they can count on their income to sustain homeownership. Millennials still dream about homeownership, but they are turning to rentals in greater numbers as they postpone that dream. Investors have taken notice. Since 2008, approximately 4.5 million homes have been sold and converted to rental properties with the majority purchased by individual investors, according to RealtyTrac data. Today, there are millions of these buy-to-rent investors and this growing group is cashing in on the share of Americans that prefer to rent instead of own. However, financing has proven to be difficult for this growing investor group. While larger investors can self-finance their purchases, individual investors are left with fewer options, according to Mohl. 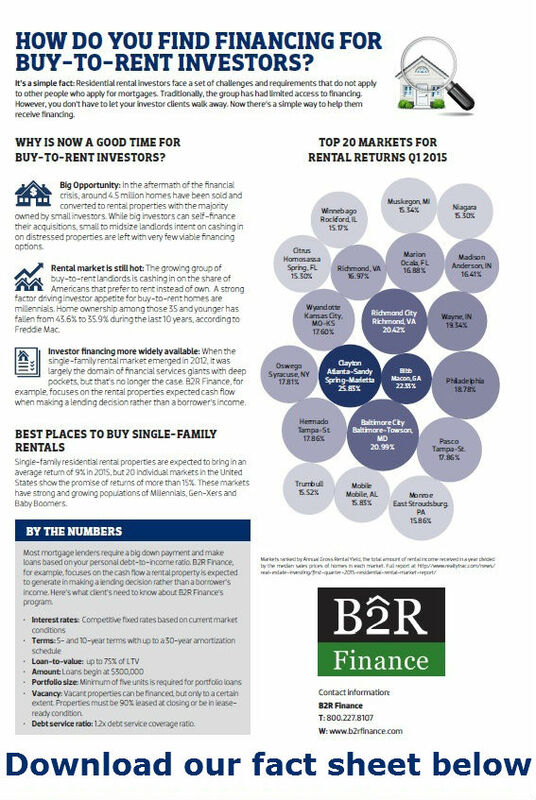 B2R offers loans of up to 75% of home values for pools of leased properties. The company’s minimum loan size is $300,000 and provides five- and 10-year terms with up to a 30-year amortization schedule. Financed properties need to be no less than 60% residential.